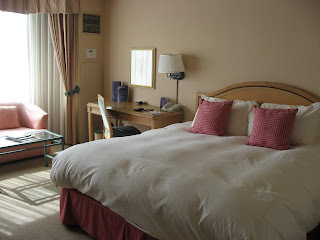 Before flying back to India, I had to be in Redwood City for a few days, where I again stayed at the Sofitel. The Sofitel's Bay 223, a French restaurant overlooking the lagoon, is a great place for a business lunch. 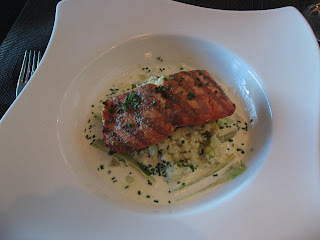 The salmon I ordered for lunch was tasty as were the crepes with fresh strawberries I ordered for breakfast on the day I was flying out. In addition to it's many charms, The Sofitel is probably among the few hotels in the US which provide a free bottle of water every day! This was also one of those rare times when I actually went out to eat Indian food while in the US. I did this primarily because a friend strongly recommended I try Amber in Santana Row. 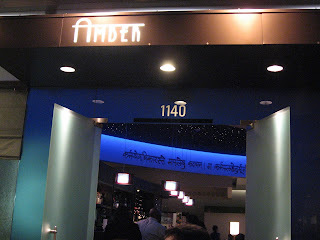 This Zagat rated restaurant has a very interesting ambience with simulated stars on an indigo background and sanskrit shlokas printed all around. Smartly dressed waitresses in indigo uniforms and tea candles on the tables all match the upscale feel to this restaurant. I ordered the Basil and Three Cheese Tikkis for starters. These are crumb-fried paneer, goat cheese & mozzarella patties flavored with basil and fennel seeds. They were good, but not great. However the Lamb Pepper Fry, stir-fried lamb with pepper corn & spices was pretty good. The kulchas, a variety of Indian bread was good too. 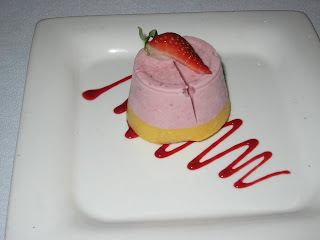 I particularly liked my dessert, the Strawberry-Mango Kulfi, an interesting variation of the popular frozen Indian dessert.